CW is! DX is! Radio is! DX is! CW is! Radio is! I am active primarily on CW, although I am occasionally active on 10 metre FM, and very occasionally on SSB, usually to practice my foreign languages. You are most liklely to find me on SSB when there are good short skip conditions into Germany on the high bands. I use an FT-757GX transceiver, which I have owned since April 1996, and it has served me well. Before that, I owned an FT200 which was pretty crap - don't believe the stories about valve technology being wonderful! Moving to the 757 was like switching on from a dummy load. I normally run 100W - the full power output of the rig - life's too short for QRP. I still haven't got round to getting an amplifier. I have no money, and would be more likely to spend money on a beam antenna first anyway. Speaking of antennae, mine is absolutely hopless! It's supposed to be a trap triband groundplane for 10, 15 and 20. However it only resonates on 30 metres. You go figure it out. I suppose political science undergraduates do not normally make good antenna designers. It was designed by me and built by my father. All design flaws are mine, not his! I use a simple Janapnese High Mound paddle, and the built in keyer on the FT-757GX. My next plan is to get a fast keyer - the 757GX keyer is limited to about 45 words per minute or so. DX IS! DX IS! DX IS! I always wanted to be a DXer. Unfortuantely until a went to university and got a student grant I lacked money - and therefore other vital prerequisites like an SWR meter to tell me my antenna wasn't resonant, QSL cards, a rig with a CW filter narrower than about 3.5kHz and the like. After I got the FT757GX I was active for the first year, then a little quieter until Christmas 1997 due to a lot of other commitments. Since then I've been back on the bands pretty regularly. You can read my list of confirmed countries here. 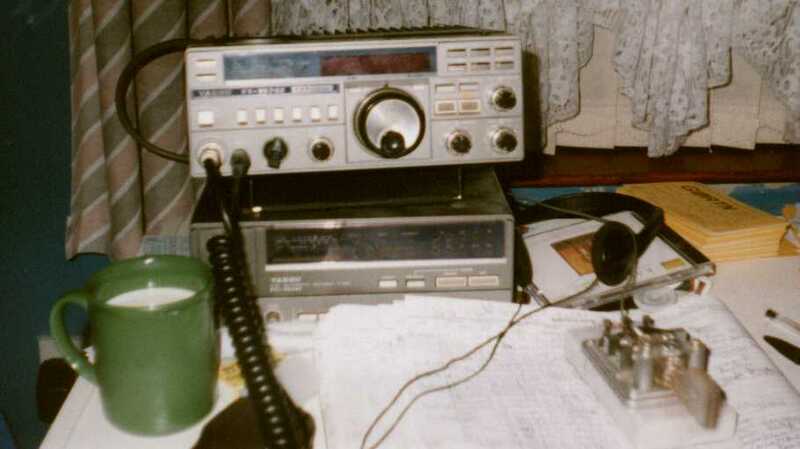 Highlights of 1998 were 9N7RW (Nepal), 5H3RK (Tanzania), ET3AA (Ethiopia) and XR1X (Chile) on 20m. TL5A (Central African Republic), 6W4RK (Senegal) VK6HD (Western Ausralia) and BZ4DHI (Shanghai, China) on 30m, E30GA (Eritrea), TU2XZ (Cote d'Ivoire) and EP2KMO (Iran) on 15m. 12 metres has been really hot - in the past few weeks I've worked lots of good stateside DX including Alberta (Canada), Wyoming, Idaho, Utah, Arizona and lots of Californians, and lots of JAs, and VK6WT. Oh, yes, and XT2AW (Burkina Faso), 9Y4/DL4MCF (Trinidad and Tobago), TY8A (Benin) S92YN (Sao Tome), 8Q7IO (The Maldives), DL1XAQ/HI8 (Dominican Republic) and C56A (The Gambia) for new countries. FB these sunspots! I haven't had much time for DXing this year, but VP2EHL (Anguilla) provided a welcome new one on 20m, as did SU1A (Egypt). I also worked VK7CW on 12m. I currently stand at 115 countries confirmed on CW with a few others on SSB only..
AC6V's ham radio world - this is a mine of information. If you can't find it here, it probably doesn't exist. QSL information search engine from Germany - This is the QSL search facility I find most useful.